I don’t limit my wine purchases to online stores and I actually buy both at producer’s cellar, as at supermarkets and specialized physical stores (which btw are opening their online version), and I think they all have their place. However, after a somewhat disappointing experience with an online shop / club (I expected more care for wine by the visible faces) I take some thoughts that I have shared with them for this article, that finally only expresses my opinion based on own and nearby experiences; the examples happened although they may seem illogical. To start it is good it has available a wide, varied and / or specialized offer. Also sold by the bottle and not just by full boxes. I like each wine to be identified by name, vintage and if necessary adding the type(s) and estates: don’t forget there are wines with the same name for the white & red, or the same name for different steps in the barrel, and even same name for different appellations. In some occasion I bought a vintage but I received another and this leaves you the doubt about whether it was a mistake (especially if it’s not the first time they do). They have also sent me red instead of white wine. There is one detail I discovered when incorporating barcode catching into the app (Download it for Android or for iPhone): they generally don’t differentiate vintages. For a "supermarket" this is functional (note that some "supermarkets" are getting better quickly), but when I go to the online store, which is supposedly specialized, I hope they care wine service as best restaurant would. And the sommelier knows that it is NOT the same. Of course, even if I know it! In addition, having the wines undoubtedly identified makes easier to find what you want among the results returned by searches at the store. Although not mentioned, it is understood this identification should also be applied to the cart, order and invoice. rigor in the description (at least that the data don’t differ with those in the bottles, and no misspellings! (Amazing, if they send you printed cards with monthly batch). data structure and filtering capabilities that will help me discovering wines using searches. BTW: scores and awards don’t matter to some people, but for others they can serve as a reference: it's okay to display the information, but don’t forget they correspond to specific vintages. If the store has its own scoring system, a legend that translates the scales is appreciated. Distribution is a very important aspect, especially in online sales. And sometimes a headache for the customer and for the entrepreneur that really cares. Let’s start with the package. 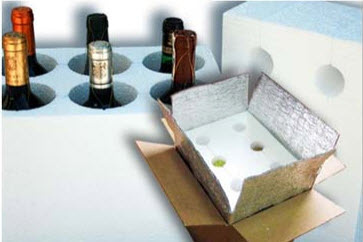 Luckily, boxes designed for shipping bottles are used in a majority way, and they protect bottles very effectively separating them individually by cardboard cells or even polystyrene, which also provide some thermal protection. I have noticed that in shops usually careful with packing, when you order an irregular number of bottles (different from multiples for their boxes), sometimes they put extra bottles "as they can". I understand you have to save costs, but you should put extra care not to spoil bottle labels or wrappings; it doesn’t cost much and supports the image of caring for the wine. 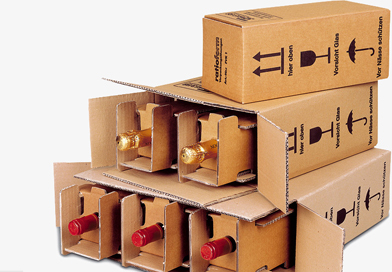 We all try to have a suitable place for the wine (light, temperature, odors, vibration); many make the effort to buy a refrigerated cabinet or wine cellar, and assume that the Store’s warehouse will be conditioned. But wine has to leave "out there" to get to its destination. 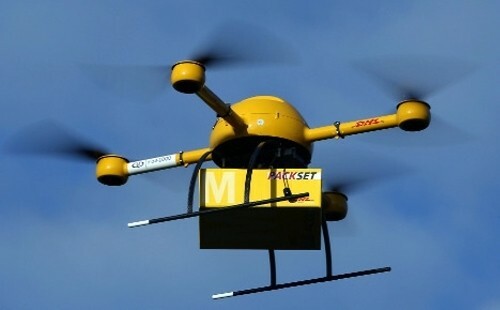 And until deliveries by drones arrive, we’ll continue waiting for the courier van. To maintain or ensure a temperature controlled transport is complicated and increases the cost, so the best thing you can do is to minimize the exposure to thermal uncontrol, maintaining an acceptable cost. A (continental, national) shipment in 24h after confirming the payment is fine. There are shops that also take care of the details and don’t send orders later than a deadline in order not to leave the wine stored by the logistics operator during all weekend. From their conditioned warehouse to your home in the shortest time possible. Result: You don’t enjoy the product as you should have done after the illusion and effort put by its creators and in addition communicate an "erroneous reality." Someday I’ll write a whole post about my vision of logistics and its future. By now you are the customer for online wine store, and this is customer for the logistics operator (or at least the store chooses it). I am sure we will soon see a paradigm shift: it’s necessary for online commerce. It is common to get mainland postage for free from a certain amount (6 bottles, 60 € ...), and also –increasingly- selecting "delivery schedule agreed" with additional charge being offered as an option, or “pickup at store or point of delivery” at a lower cost, just as discounts for payments by bank transfer are offered. And now is when we talk about money! The price should be able to be shown tax-included, and must be competitive while fair. Without this symbiosis, future will be even more difficult for the store. The problems to collect / pay are not so usual, but this is the sensitive area for the client (the pocket) and when they happen the concept of "Secure Payment" is eroded. Let there be no failure that remove cart information. I am probably too ingenuous and should pay more attention to the protection of my data etc. If you notice, the information isn’t always offered in a simple, understandable, and not too long way (giving impression of "small print"). I am one of those people who value the word, so I hope they meet what is offered. Similarly I don’t find acceptable they write some ambiguous conditions that could seem what will not be. Because they will serve to be right only once against me, and as a gift, also for me to "make social" my experience. You have to be honest, and above all, to answer; and to everything that is exposed (ie to answer a suggestion won’t be not considered when it will happen). I appreciate that the store take the initiative and contact promptly to incidents to resolve or explain (when it doesn’t occur whenever you place an order, of course). Personal attention is also shown avoiding repeating the same mistake with the same client. It is also good to contact by phone without added payment (be able to call a toll free number or a fixed, not a special pricing one). Or availability of Skype and Whatsapp or similar, and if the contact is by email, try to respond in a couple of hours during business hours. And something must be done, not only to correct the error, but to palliate its effects. About faulty product, not all stores are easily found its policy in this regard; and to have in view would be good. In any case giving an answer without delay is the minimum that should be done, (and I don’t mean the automatic mail "we received your email and we will contact"). Having a referent in the team, or varied punctual collaborations is attractive (when you tune to their tastes); someone with a recognizable career participating (which is not limited to promoting the store posing for the photo). Instilling respect for the work of those who make it possible to enjoy that wine. Monthly selection of lots of different wines ... 2-3-4-6 (no repeats) as a club to support learning and deepening knowledge. And in this line, permanent and specific thematic lots varying adapting to available stock. Good excuse for a tasting taking advantage of them, especially if there is documentation explaining the selection connecting links / theme, tasting recommendations and other elements (clues to find nuances, plus tasting notes) to provide educational value. Customized suggestions based on simple tests (short, entertaining) surveys, shopping and ratings history, user configuration ... Not to mention that likes and tastes may be changing and the customer evolves, don’t typecast (forever). Share opinions, promote virtual and non-virtual tastings ... I mean, broaden the experience of enjoying wine, caring and encouraging the social aspect. Promote or facilitate the management of joint purchases (best price for all, less accessible priced bottles sharable in a hangout). From the store to my ... phone. If you are one of those who have installed an app through which you track what you have in your cellar, what you want to have, what you took and what you thought, you thank to have available your wine data, not being filled by yourself. If this doesn’t happen at least you have the satisfaction that another person can take advantage of what you filled because you share it. I could have started a post about "my ideal mobile app on wines," but instead I began playing and created dastagarri, and it already goes looking like slowly. Can you imagine a shop.dastagarri.com ? Meanwhile you can invite me to a wine ! It has been a very long post, thank you for reaching to the end.